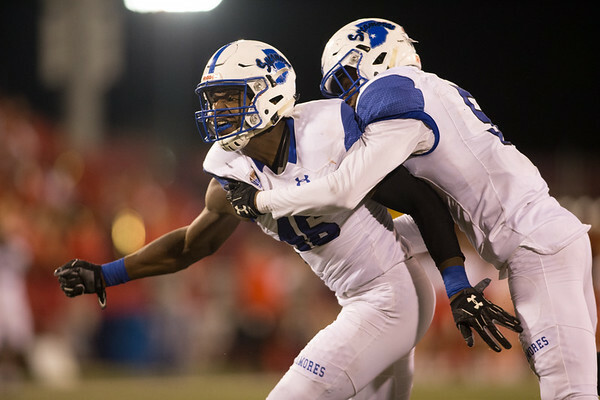 For the second half of my Saturday doubleheader I photographed the Indiana State football game at Illinois State. This is one of those rivalries that makes college sports so much fun to watch. These teams don’t like each other, and it can be more than just a game. As crazy at it sounds this was my first time seeing the rivalry in person. From the opening handshake that all of the players were a part of the men handled it on the field. That is how it should be done. I can’t wait to see this rivalry again next year in Terre Haute. 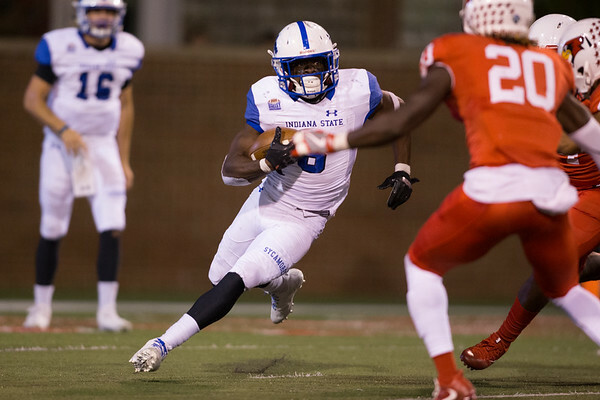 This was a fun game to photograph as I had taken a week off of football after the Liberty game. I was ready to go maybe even before the team was. Waiting for the coin flip it seemed like the band would never leave the field. Right now I am looking at a couple of weeks before I will photograph football again. I am sure that time will go slow once again before I am able get back onto the field again. One thing that at times can be hard to capture in football is the emotion. You are already at a disadvantage as the players have helmets on that hide much of their face. You are also farther away from the action than in most sports making something hard even harder. That is what makes it so great when you nail an emotion shot. As I said before this was a rivalry game, and the emotion seemed to be a little more intense as the game went on. It started to make me feel good as I was putting several good reaction shots into the gallery that I had something good going there. Emotion is what drives me to make photographs, and there was plenty of that to go around Saturday night. This is my second visit to Hancock Field. The previous visit was to photograph the Richmond Spiders in the FCS playoffs. That was a late December game so I never really was able to see anything in the light. When you only see a venue in the dark it is easy to miss a lot of things. 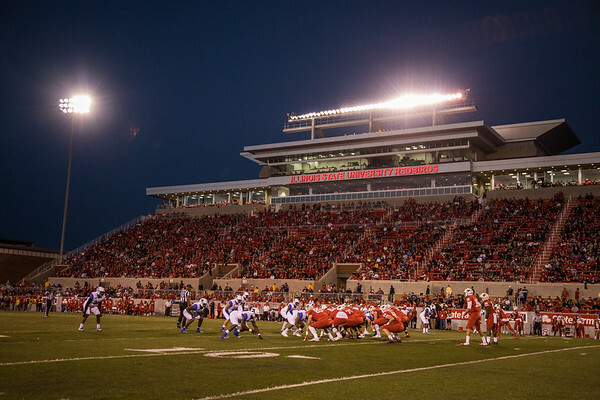 Hancock Stadium is a very nice FCS stadium that I am sure is used in the recruiting of the players here. As I was photographing the game I realized that this is the fifth college game that I have shot this year in the fifth stadium. Had I made it to the Purdue homecoming game that would have been six games in six different stadiums. 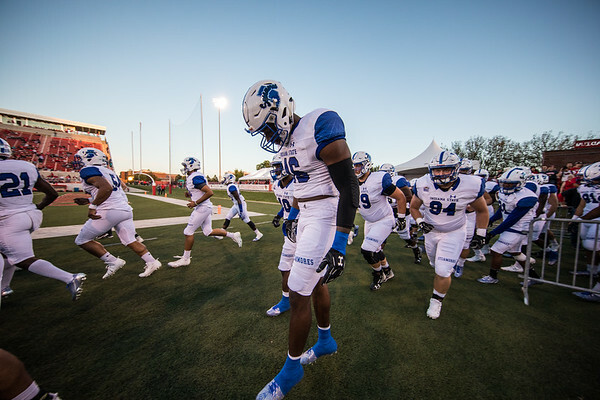 When I started shooting at Indiana State it was initially to get photos in my portfolio that were of somewhere different than Purdue. With a start like I have had this year you can say mission accomplished. This blog is here to talk about everything from my day. Good or bad I usually talk about it. Saturday I had a lot of good on my side. Enough good was happening that I was feeling a little cocky. Photography has a way to bring you back down to Earth quickly though. 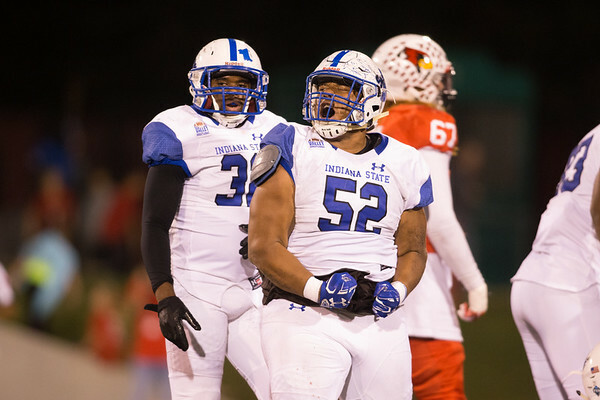 Indiana State only scored two touchdowns on Saturday night. I was lucky enough to have gotten back down onto the field after halftime to capture the interception return for a score. The second touchdown is where the bad happened. See this photographer bit hard on the run fake. So hard that he completely missed the pass for the touchdown. The ball carrier (he really didn’t have the ball) was behind a pile of people and I thought that I was being patient waiting for him to burst out of the pile. What I didn’t know was that at that time the ball was being lofted to a location right in front of me. I missed the shot of the first touchdown for the freshman. That hurt a lot, but during a game there is no time to brood. I moved locations quickly and ended up making one of my favorite defensive pictures right after that. You miss shots shooting sports. It happens. What you do after you miss a big shot can be the difference between a good gallery and a bad one. That still doesn’t mean that I don’t think about that shot though. Last week was an interesting week full of new sports again and more birthday parties. I was able to shoot a couple of longer days which is what I like. I always still like to think that I do my best work when I am swamped. The more I shoot the better I think my images are. A couple of doubleheaders back to back are my kind of fun. A quick trip to the Feast of the Hunter’s Moon before Lanie’s birthday party Sunday was a great way to close out the week. You can see some of my favorite photos from last week here. It is impossible to talk about football from last Saturday without mentioning the loss of Joe Tiller. I never really had a meaningful conversation with the man. I met him several times, but it was all very quick social interaction. When I arrived in Normal Saturday the first thing I saw when I opened my phone was the news that he had passed. It hit me very hard. All day long it kind of lingered with me. For me Joe Tiller is the reason that I am a Purdue fan. Joe Tiller is why we Boiler Up. Joe Tiller is why we turn on the Saints game to see a guy nobody else wanted in college set NFL records. Joe Tiller is why Ross Ade Stadium looks as good as it does. Joe Tiller is Purdue football. He was the kind of guy that it seemed like anyone could hang out with. He left a legacy at Purdue that will be tough to match. 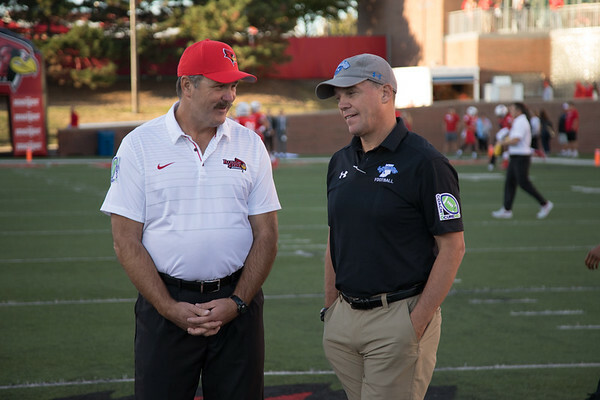 That was never more apparent than during the game seeing Brock Spack and Billy Dicken on the sideline for Illinois State. That reminder all game of how Joe brought his staff over from Wyoming to West Lafayette to turn a kid nobody thought much of into the talk of the Big Ten. I won’t be around next weekend, but I know that Purdue will do something amazing for Coach Joe.